During pre-production of one of the world's most exclusive and hotly anticipated new supercars you'd think the manufacturer would want to keep pretty low key, right? Not in Ford's case, apparently, after three of its prototype GTs were busted for speeding in Glenwood Canyon, Colorado. The mules were reportedly taking part in high-altitude development testing when they were pulled over by police officers from the Eagle County Sheriff's Office and Colorado State Patrol. Their crime? Going "way faster than the 50 mph speed limit", claimed local news outlet Vail Daily, however it didn't reveal exactly how fast, or if the engineers behind the wheel were fined. 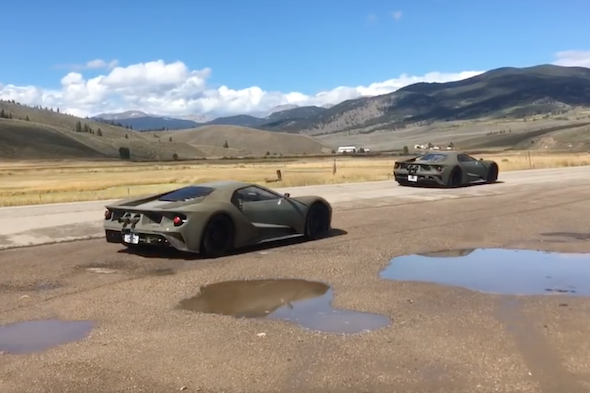 Footage of two of the khaki trio testing in nearby Sargents was shared to YouTube earlier this month, in which their 700+hp twin-turbocharged 3.5-litre EcoBoost V6 engines create a tuneful racket.